It almost looks like these sandhill cranes are walking along the top of my fence… but they’re just on the high field across the draw from my fence. Good thing I took this pic yesterday… today it’s blizzard conditions… I imagine they’re hiding in some brush tonight for protection from the storm! I am all about birds and love your bird photos!! Love this shot…should go on a calendar! are having a “high wind warning” tonight which means it’s likely to down some trees and power lines….sort of typical of the variety of weather we get here in Buffalo, NY. I’m in Southern California so I’ll not say anything about weather except to note that you can send us any spare snow and rain. When my girls were small a favorite book was “Cranes in my Corral” about a flock of sandhill cranes. Good memories. Thanks. 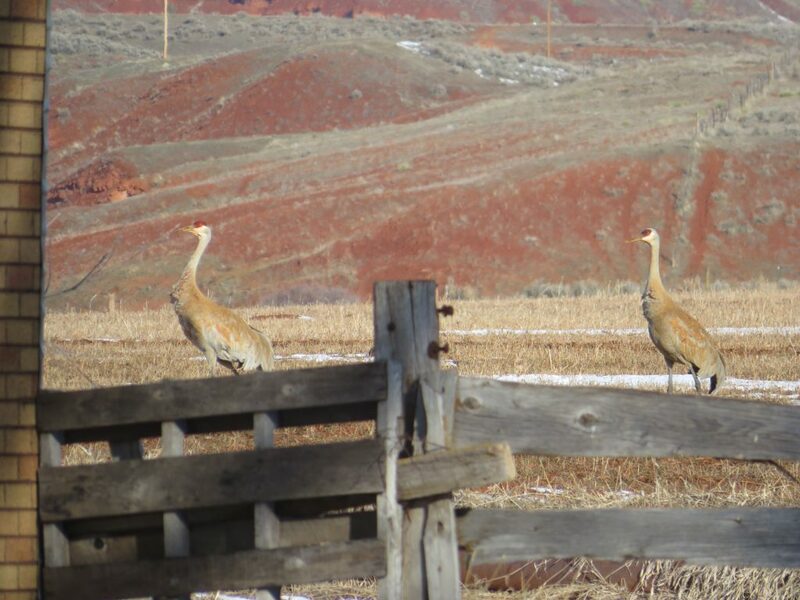 I was fortunate to see the sandhill cranes the last time I was in Wyoming, but at a distance. I understand they can grow to be 5 foot tall measuring from the ground to the top of the head. What is the typical size you see there? Carol,you certainly are the “camera master” I have yet to see my 1st. sandhill crane, better take care of that! Great photo, Carol! Isn’t this spring weather something? I have yet to figure out how to sleep well when these Wyoming winds are howling down through the chimney and ripping around the corner of the house!